When speaking about chutneys if, its spicy then it becomes my favourite. Sidedishes becomes important without which the main accompaniment becomes less exciting. 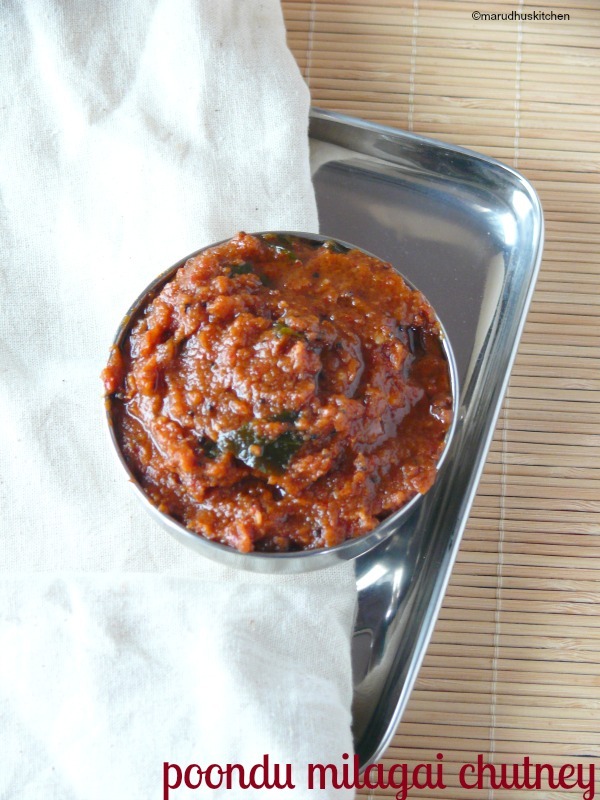 This chilli and garlic chutney is a special chutney close to my heart because of its spicy tangy balance making you to have extra dosage of idli. I learnt this chilli and garlic chutney/poondu chutney from my neighbour friend whom I admire for her well worse cooking skills.Very apt side dish to go with idli,dosa and paniyarams. Even I love having it with Gothumai dosai and adai. 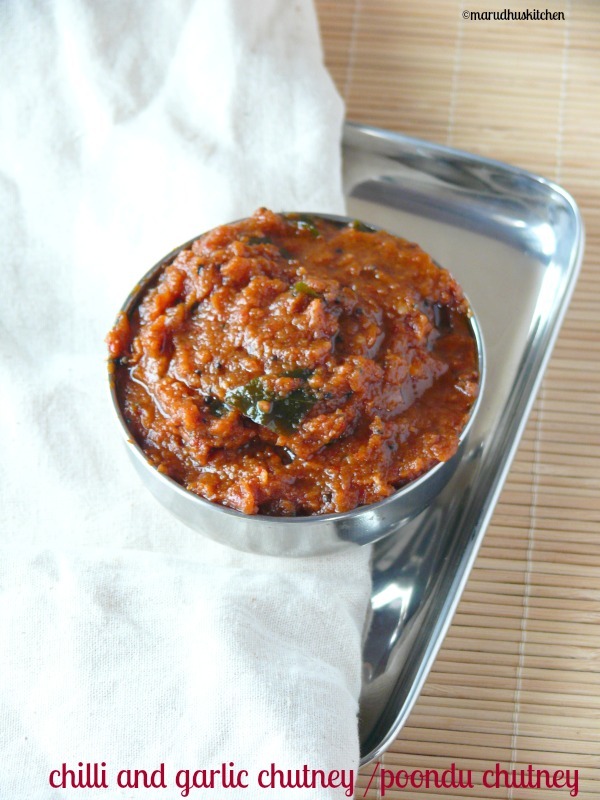 If you want to avoid spiciness you can use kashmiri chillies alone.Using kashmiri chillies gives a vibrant red colour without a fiery taste.Add tamarind in correct amounts otherwise it will become too tangy.The very specialty about this chilli and garlic chutney is that it can be made without adding coconut. 1.In a mixer jar take all the to grind ingredients make a paste by adding water,salt and keep ready. 2.Keep a kadai add oil add mustard ,when it splutters add hing and curry leaves. 3.Add the ground mixture sauté till the rawness goes off. 4.Adjust the flame and cook. 5.When oil oozes take out . 6.Serve with idli or dosa. In a mixer jar take all the to grind ingredients make a paste by adding water,salt and keep ready. Keep a kadai add oil add mustard ,when it splutters add hing and curry leaves. Add the ground mixture sauté till the rawness goes off. Adjust the flame and cook. When oil oozes take out . You can saute the ingredients before grinding in little oil and then also you can grind. For the above method you need not cook further only tempering is enough. Use gingelly or groundnut oil for more flavour. What’s that on your plate? Easy Chutney and finger licking good!! I prepare this often..